On the day that President Obama delivered his most recent State of the Union address, Lisa Nelson, CEO of the American Legislative Exchange Council (ALEC), set forth a markedly different path for the nation’s future over at the RedState blog. A former Capitol Hill powerhouse who has also held major corporate executive positions, Nelson is a feisty advocate for free markets and limited government. While President Obama that night foresaw a country in which the federal government became increasingly activist and dominant in all spheres of our lives, Nelson argued for federalism and state legislatures taking a greater role. “State legislatures have the power to set innovative and bold agendas, and legislators should prioritize policies that put the American people and their livelihoods first,” wrote Nelson, who became CEO of ALEC last summer. Before joining ALEC, Nelson was Head of Global Government Relations for Visa, Inc., and before that she was a top executive at Time Warner. In addition to corporate smarts, Nelson acquired an insider's knowledge of the political process as former Speaker of the House Newt Gingrich’s public affairs liaison. She had previously been executive director of GOPAC. GOPAC was founded in 1978 by former Delaware Governor Pete du Pont. Under Gingrich, GOPAC became a prime vehicle for preparing fledgling GOP candidates to seek state or local offices. ALEC does not lobby but instead provides members with research, policy papers, and ALEC’s famed “model policies”—or prototypes from which state legislators can pick and choose ideas in thinking through and formulating their own pieces of legislation. Nelson describes the creation of model policies as “a ground up, bottom up process” and adds that the impetus for a model policy comes from legislators. In the coming year, ALEC will focus on the need to simplify state tax codes, cutting red tape that hampers entrepreneurship and hiring, ways states can force the federal government to be accountable for its budget, market-driven solutions to energy problems, ensuring that American students are prepared to take their places in the global economy, and “worker freedom,” or the right to refuse to join a union. As Nelson noted in her RedState blog, right-to-work states have an 8.6 percent economic growth rate, which is more than twice that of forced-union states. ALEC also supports making it easier for charter schools to be set up and function. 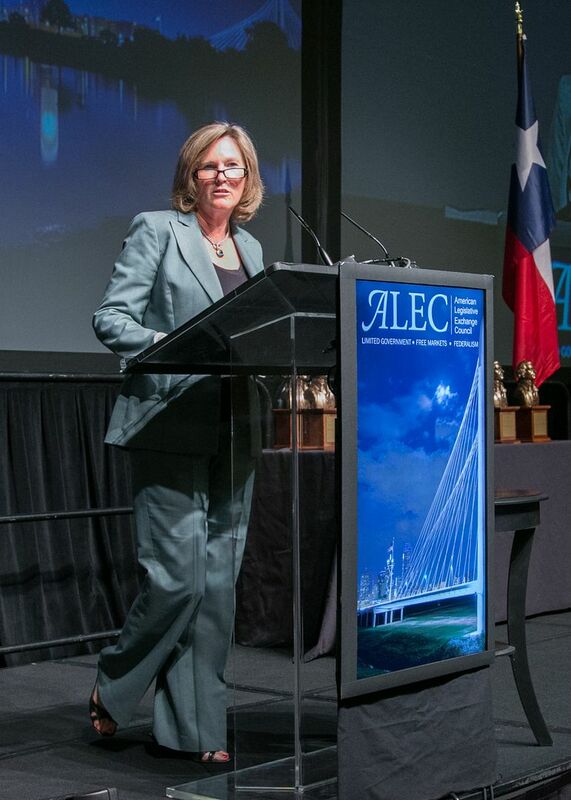 Reform of the criminal justice system is another item on ALEC’s agenda. The organization proposes that states re-examine mandatory minimum sentencing and take steps so that ordinary citizens will not inadvertently be turned into criminals by accidentally breaking a complicated regulation or rule that they either didn’t know was on the books or was so complex that they didn’t interpret it correctly. The state of Ohio has already enacted such a law. If you can judge an organization on the basis of its enemies, ALEC is definitely an organization that has arrived as one of the biggest players on the conservative end of the political spectrum. Indeed, a Washington Post article on Nelson’s ascent to the nonprofit’s leadership position called ALEC the “free-market group that has become a bogeyman of the left.” The leftwing Center for Media and Democracy has an “ALEC Exposed” website, while ALEC regularly comes under attack in the Huffington Post and other left-leaning outlets. The Journal then went on the say this of SiX founders: “These are the same people who have been bashing ALEC as corrupt because it favors smaller government, and who bullied timorous corporations such as Coca-Cola , General Motors , Procter & Gamble ,Google and Microsoft into dropping their membership. Nelson said that, despite some highly-publicized defections, ALEC ended 2014 with more members than before the resignations. ALEC, by the way, is nonpartisan. The membership is attracted not because of party affiliation but because of a mutual commitment to limited government and free-market principles. As one of the top women in the policy field, Nelson said she has always had a secret weapon: husband Dave Nelson, who set up a business at home so that he could be available for the Nelsons’ son and daughter, now both in their twenties, while Lisa worked for Speaker Gingrich. Even with her husband at home, however, Nelson had rules about time with the family. “I had a rule that I would go out only one work night a week for a work-related function,” she said. ALEC is, as the Wall Street Journal puts it, “poised to become even more influential” after the 2014 midterms, which saw even more conservative, free-market types elected to state-level offices. And that makes Lisa Nelson one of the most influential conservative policy wonks in the U.S.—if she wasn’t that already.